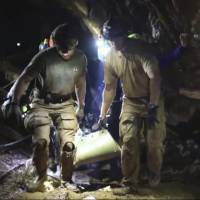 MAE SAI, THAILAND - Rescuers who pulled a young Thai soccer team from deep inside a flooded cave were dismantling their work site Thursday as plans emerged to turn the spot into a museum in tribute to the daring operation. At least one film production house was already working on a treatment of the heroics of divers, cavers and medics who risked their lives to free the Wild Boars. Stunning footage of that rescue was released Wednesday showing the youngsters — ages 11 to 16 — being stretchered to safety. They were also seen sitting cheerfully in their hospital beds, where they are being kept in isolation until doctors are sure they did not pick up any nasty diseases during more than two weeks in the dark. Workers were Thursday packing up the industrial water pumps, heavy-grade machinery and construction equipment at the mouth of the Tham Luang cave, which had been a high-tech command centre during the 18-day ordeal. The rescue of the team was still being celebrated in Thailand as the 12 boys and their 25-year-old coach recovered in a local hospital. 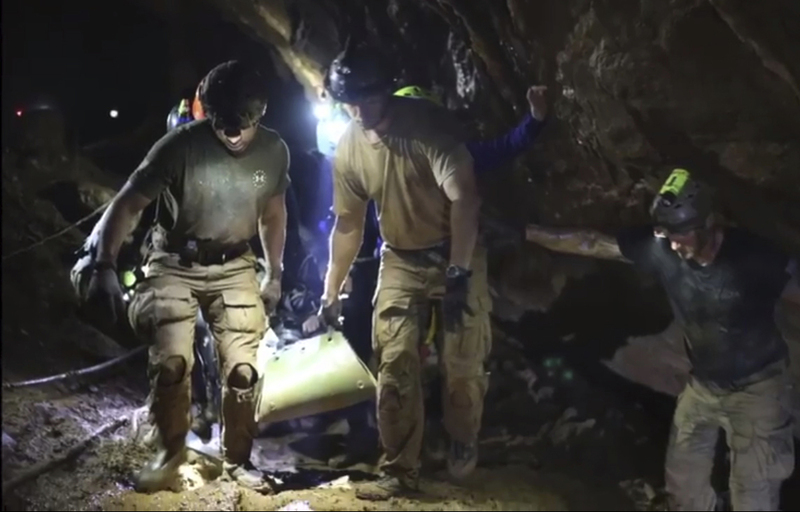 The saga started on June 23 when the players walked into the Tham Luang cave complex after practice and were trapped when monsoon flooding blocked their exit. Nine days later British divers found the disheveled and hungry group perched on a ledge 4 kilometers (2.5 miles) inside the cave. Over the following week, experts from around the world descended on northern Thailand and rescuers pumped out more than 50 Olympic-size swimming pools’ worth of water. A huge media pack of more than 1,000 journalists gathered at the mouth of the cave feeding audiences all over the globe with every twist and turn of the dramatic rescue until its joyful conclusion on Tuesday. The huge international interest in the story sparked immediate talk of books and films. Michael Scott, the managing partner of faith-based production house Pure Flix, said the company intends to pursue a film about the against-the-odds mission. Scott, who lives in Thailand and went to the site in Chiang Rai as the boys were being pulled to safety, made the announcement late Tuesday on Twitter in a video. “We’re here really looking at this as a movie that could inspire millions of people across the globe,” Scott said.